Earth Links Material & Financial Donations | Earth Links, Inc. Since its founding in 1991, supporting other nonprofit organizations has been at the core of Earth Links’ mission of “bringing people and resources together.” Throughout those nearly twenty five years, Earth Links has donated over one million dollars worth of materials to other nonprofits, including clothing (both new and used), software, computers, communication gear (such as satellite phones and ham radios), office supplies, and other items. These materials have been and continue to be critical to the work of women’s shelters, children’s art programs, community development projects in our local community and for indigenous peoples. Material donations bring balance to our work of providing nonprofit consulting services, engaging in environmental education and advocacy, and assisting in forming new nonprofits. All these donations are made possible by Earth Links’ partnerships with corporate donors, companies, and individuals, as well as volunteers who often provide the insight needed to match donations to organizations. We send a huge thank you to all those volunteers and donors who have made this work possible. We make small financial contributions to other nonprofits to help them complete special projects or to help them build their capacity to meet new challenges, such as contributions to help form a fair trade coffee cooperative or to help fund the first project of a new NGO. 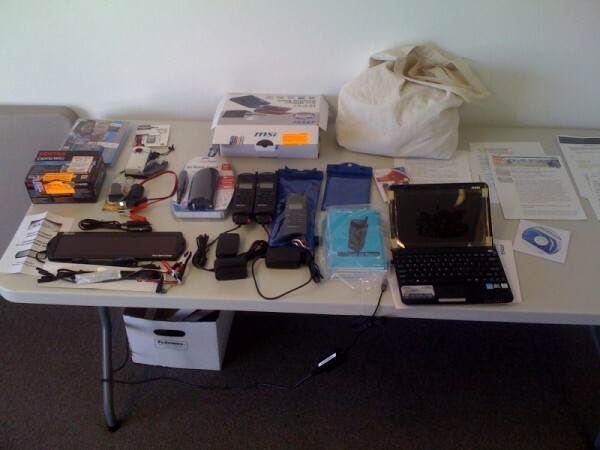 Satellite phones, computer, solar recharger, power converter, camera, and other supplies donated to the Rama Nation in May 2010 to aid in their fight for land rights. Donate now to help our continuing efforts to provide people with the resources they need!